The Wailua Valley State Wayside Overlook on the Road to Hana. Shelley Seale photos. On the popular island of Maui, this classic (yet distinctly Hawaiian) road trip is one of a kind. The Road to Hana takes visitors down 50 winding miles of highway along Maui’s north shore, connecting Kahului with the town of H?na in east Maui. Making this trek across the stunning landscape of the island offers unique cultural activities along with gorgeous natural scenery and exciting outdoor adventures. Our mini-guide highlights some of the best things to be seen and experienced along the Road to Hana, and in the surrounding areas of Maui. Snorkeling with sea turtles at Molokini. Anywhere there’s an ocean, particularly with a rich and diverse sea life, people who love the water’s depths will be found snorkeling or scuba diving. Maui offers a lot of excellent spots for both. The volcanic Kanaio Coast is the place to explore a rarely seen part of Maui, with its variety of remote, exotic snorkel/dive sites accessible only by boat. Volcanic formations, caves, and blowholes provide excitement, along with the stunning variety of tropical fish found in the pristine coral reefs; as well as spinner dolphins and green sea turtles (which we saw!). This area of South Maui is where the last volcanic eruption flowed a little over 220 years ago. It is a rugged area full of lava arches and sea caves; this part of the coastline is not accessible by car and only a few hike the lava rocks. Blue Water Rafting takes people out there the fun way — on a Zodiac-style raft that speeds along the waves for an aquatic roller-coaster ride. After checking out the crashing of the sea against the lava formations (and a few celebrity homes in this out-of-reach spot), the Blue Water Kanaio adventure makes two snorkeling stops at exquisite reefs, known for the abundance of fish, eels, and green turtles. Maui Wine. Photo by Marilyn Jansen Lopes of Maui Country Farm Tours. Located on the high elevations around Haleakala, the fertile slopes of Upcountry Maui are home to ranches, botanical gardens, and farms with soaring views over the misty mountains. Cool breezes are a refreshing change from sea level, and there are a variety of makers that have farms or property that is open to the public, often for tours and tastings. 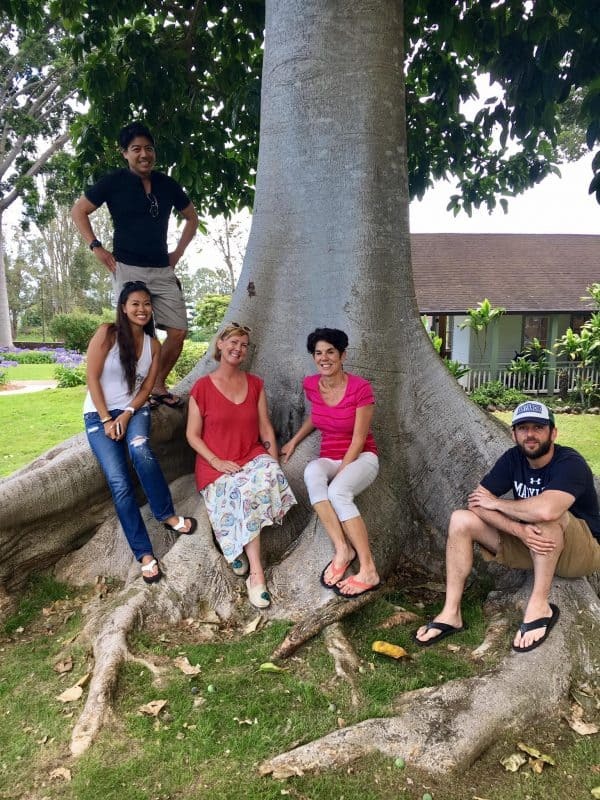 Maui Country Farm Tours is a great way to see a variety of these places on one easy itinerary, guided by Marilyn Jansen Lopes, who owns the business with her husband. Marilyn is a knowledgeable and extremely personable guide — a little wacky, but in a fun way. Ocean Vodka Organic Farm & Distillery: Using sugar cane that is organically farmed on the rich, volcanic soils without the use of synthetic pesticides or herbicides, this state-of-the-art vodka distillery offers a tour and tasting, where you can also sample some of their popular (and unique) vodka goat cheese truffles. The views out across the valley are stunning. Ali?i Kula Lavender Farm: This was my favorite stop on the itinerary. The lush, tropical gardens are so gorgeous and peaceful that it’s hard to do them justice with mere words; I could have stayed here all day. The 13.5-acre farm resides at an elevation of roughly 4000 feet and is home to approximately 55,000 lavender plants within 45 different varieties. But it’s not just lavender; the garden is overflowing with olive trees, hydrangea, Protea, succulents and an exceptional variety of other plants. We were served lavender tea and the most delicious scones I’ve ever tasted; the gift shop is worth a (long) browse. 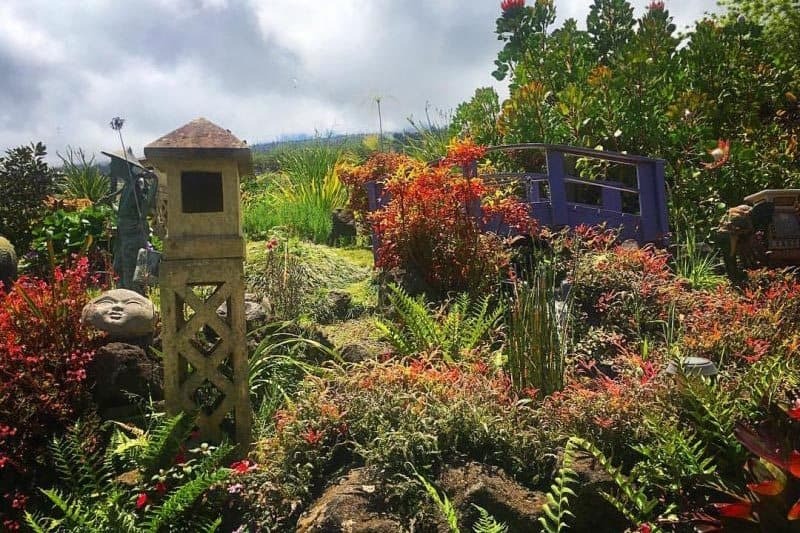 The lush Japanese garden at Ali?i Kula Lavender Farm. MauiWine, ?Ulupalakua Vineyards: This is Maui’s only winery, open since 1974. The winery is built around historic buildings from the original ranch and is just down the road from the vineyard, which encompasses 23 acres of beautiful Maui countryside. 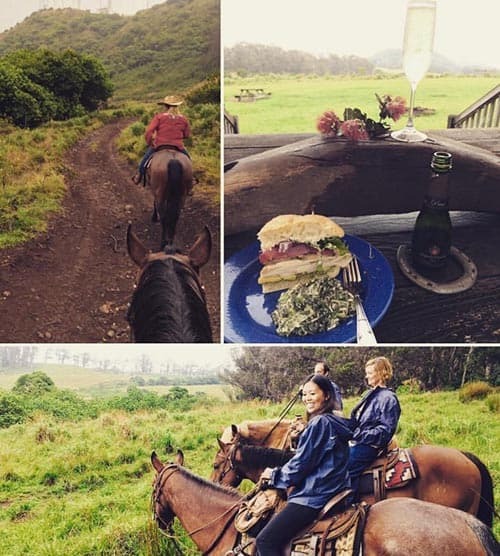 Trail ride and lunch at Piiholo Ranch. While most people automatically picture the beaches and stunning coastline when they think of Hawaii — a completely accurate depiction — the mountains and highlands are as much a part of the islands as the ocean. Taking a horseback ride along mountain trails offers a way to see Maui that is unlike much of the scenery you’ll find doing other activities. Piiholo Ranch, near Lahaina, is the perfect place to do this. The ranch has been in the Baldwin family for seven generations and is located in Maui’s Upcountry at the edge of the rainforest, 2,000 feet above the Pacific Ocean. With plenty of wide open ranges for horseback riding and panoramic views, Baldwin’s legacy trail makes for a fascinating Hawaiian “paniolo” cowboy adventure. Twin Falls is one of numerous waterfalls you’ll see along the Road to Hana. When you’re ready to start the actual Road to Hana, the route begins just outside Paia town, at the intersection of Hana Highway 36 and 360/Baldwin Avenue. And be sure to fill up with gas — this is the last place to do so before reaching Hana, some 50 miles, 54 (mostly one-lane) bridges, and 600 hairpin turns. While the actual driving takes around three hours, give or take, you’ll want to allow much longer in order to take in the wonderful sights along the way that make this one of the best drives in the world. The route passes a number of stunning waterfalls, including Twin Falls (Mile Marker 2), Upper Waikani Falls (MM 19), Twin Falls (MM 24) and Wailua Falls (MM 45). There are also a number of overlook vistas that are must-stops — especially since the entire drive is pretty much a series of jaw-dropping moments, but the sharp curves and lack of road shoulder make it impossible (and dangerous) to pull over much of the way. The Wailua Valley State Wayside Overlook. 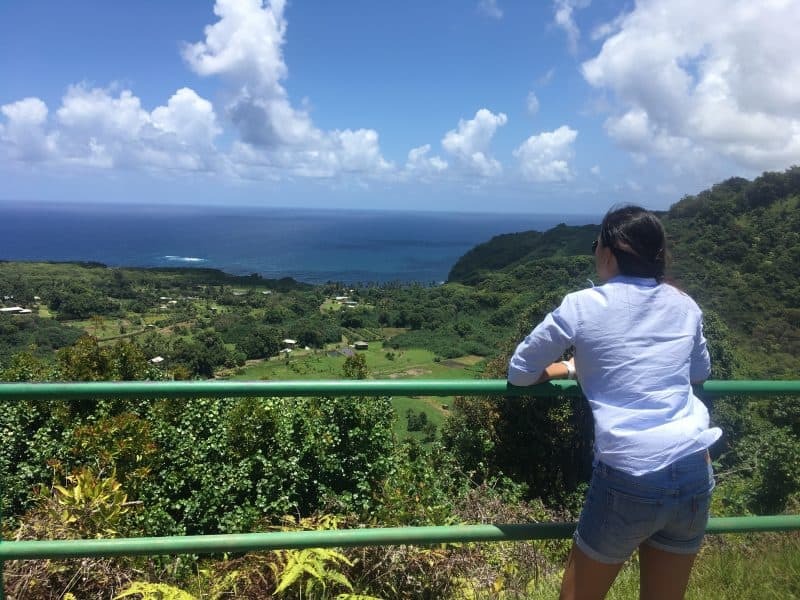 Don’t miss a stop at Ho’okipa Lookout (MM 9) and Wailua Valley State Wayside (MM 12), where a climb up the stairs to the viewing platform affords amazing views look down onto the historic village and taro fields of Wailua, set against the deep blue waters of the Pacific. Wai? ?napanapa State Park (MM 32) offers one of the best, and most interesting, beaches in Maui. 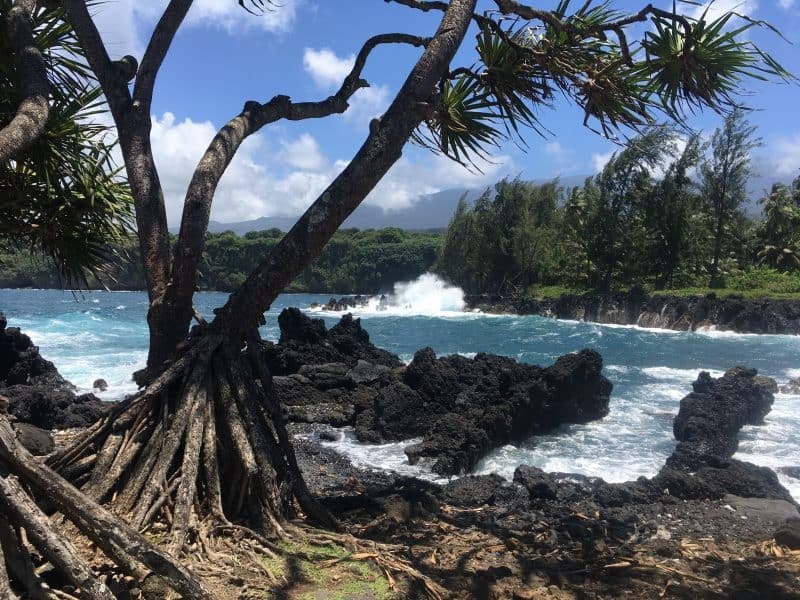 The 122-acre state park has a black sand beach, tide pools, seabird colonies, lava tubes, blowholes, freshwater caves that you can explore, and a natural stone arch. Other beautiful beaches worth a visit include Hamoa Beach (MM 50) and Koki Beach (MM 51), a good spot for surfing. The stunning black sand beach at Wai? ?napanapa State Park. Maui’s explosive past is on full display at the Ke?anae Peninsula (MM 16). Stretches of green fields are stopped in their tracks against a black, jagged shore of lava rocks, a lasting reminder of the incredible lava flow from Haleakala Crater that created this peninsula. Today, this dramatic seascape is a must-see for both photo ops and a taste of Hawaii — the shave ice and banana bread at Aunty Sandy’s are legendary. For an adventure beneath ground, check out Ka? Eleku Cavern (1/2 mile off the highway at MM 31). This is a long underground lava tube that visitors can walk through; they also have picnic grounds and cool botanical garden maze. 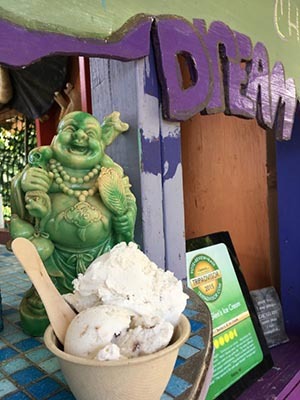 The delicious ice cream and fun vibe at Coconut Glen’s is well worth a stop. As you near H?na Town — one of the most isolated communities in the state — a stop at Coconut Glen’s (MM 27.5) is a must. This iconic ice cream stand is well known in the area for its delicious, non-dairy & vegan ice cream made with coconut milk. The stand has a cool little vibe as well; look for the giant chair created by actual living plants. Hana itself is a great place to chill for a few days — and you’ll find it is completely unlike the rest of Maui. This is really a small, sleepy little village, and the place to relax. If you’re into eco-retreats with plenty of room and natural beauty, stay at Ala Kakui, a small retreat and native Hawaiian cultural center. Another option is the Travaasa Resort, with a world-class spa, Preserve Kitchen + Bar, and a host of daily activities from yoga and canoeing to bamboo pole fishing and lei making. The incredible view at Ke?anae Peninsula.